The potential for using ground-based LiDAR to detect representative improvised explosive devices (IED) triggering command wires was investigated using a simple field test and complex image analysis. Six typical desert soil surfaces, ranging from smooth compacted silt to rough loose gravel, where scanned using a LiDAR (terrestrial laser scanning) mounted on a tripod at about 1.8 m above the ground surface. Identification of wires in scanned images was evaluated using surface elevation (microtopography) and surface image intensity (reflectance) with best results using image intensity. Wire detection required segmentation of intensity images using only the lowest 1 % reflectance values and detection of linear elements using algorithms that combines the LoG edge detection method and the Hough Transform function. Wire detection was possible only for wires greater than 3 mm and only for surfaces with the lowest surface roughness. Results indicate that LiDAR may be able to detect command wires at the ground surface using image intensity but critical issues such as rapid image and data processing would be required to utilize LiDAR imaging of surface, especially for application of LiDAR from a moving vehicle. We thank Terry Sobecki (U.S. Army Engineer Research and Development Center, Cold Regions Research & Engineering Laboratory) for initial funding for this project. We also thank Valerie Morrill for help in the field and Sara Jenkins who operated the LiDAR in the field and assisted with data analysis. Exampled of command wires used in this study where provided by National Counterterrorism/Counterinsurgency Integrated Test and Evaluation Center personnel at the U.S. Army Yuma Proving Ground. Partial funding for this project provided through Yuma Proving Ground contract No. W9124R-07-C-0028/CLIN 00001-ARCN-AA and U.S. Army Research Office grants DAAD19-03-1-0159 and W911NF-09-1-0256. 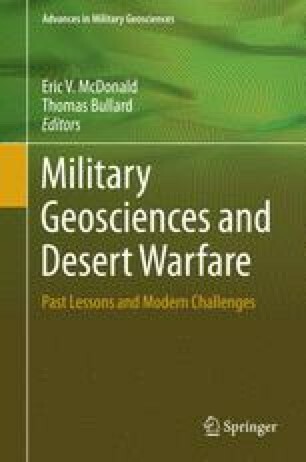 Any opinions, findings, and conclusions or recommendations expressed in this material are those of the authors and do not necessarily reflect the view of the U.S. Army Research Office or the Yuma Proving Ground.